The season begins to change in September as average highs dip 10 degrees in Czech Republic, reaching 18°C (that's about 64°F) during the day. Evenings for September are still seasonably cool with night time temp averages of 10°C (about 50°F). Average wet days for September are one of the lowest of the calendar year. Though rainfall days are lower, precipitation downpours are still above normal. Umbrellas are recommended during sightseeing adventures. You can find current weather conditions at http://www.weather.com/weather/today/l/EZXX0038:1:EZ. Currency of the Czech Republic is the Czech koruna (Czech crown), sign: Kč, code: CZK. Exchange of foreign currency is available at Prague international Airport and at most hotels, banks and exchange offices throughout the city. International credit cards are accepted for payments in hotels, restaurants and shops. Payment in cash in EUR is also available in some restaurants and shops. Czech Republic is in the Central European Time Zone. Central European Standard Time (CET) is 1 hour ahead of Greenwich Mean Time (GMT+1). Like most states in Europe, Summer (Daylight-Saving) Time is observed in Czech Republic, where the time is shifted forward by 1 hour; 2 hours ahead of Greenwich Mean Time (GMT+2). Daylight Saving Time ends on October 26 at 01:00 GMT. Czech Republic uses a 230 volt 50 Hz system with standardized round plug with two round pins measuring 4.8 by 19 mm (0.189 by 0.748 in), spaced 19 mm (0.748 in) apart and with a hole for the socket's ground pin (CEE 7/5). This standard will also accept Europlugs and CEE 7/17 plugs. Sockets are installed with the earth pin upwards. Although the plug is polarised, there is no universally observed standard for connecting the live and neutral. 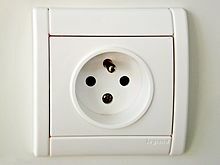 The former Czechoslovakia Standard ČSN 33 2180:1979, section 6.2.2. required live to be on the left side of socket.